This is part of the Successful Businesses Interview Series, where I feature successful businesses that are making a difference in others’ lives. Wide selection of ingredients. I’ve been to a couple other salad bars before, and their options aren’t comparable. There are many ingredients to choose from (over 60). Unlimited ingredients with custom salads. The salad bars I’ve been to in Singapore limits you to just 4-6 ingredients, with additional cost of $1-2 USD per topping. I love that SS lets you choose an unlimited number of ingredients with the custom made salads / wraps, at no extra cost. Over 60 different toppings to choose from and 20 homemade dressings (My favorite is Japanese Wafu). One of the salad choices from the menu. You can either order from a ready menu or create your own salad/wrap. I always go for a custom creation, wrap-style. Earlier this week, I met up with Adrien (co-founder / co-owner) and Michelle (Marketing Manager) from SS. It was great hearing about Adrien’s vision and direction for the SS chains – he has a clear vision for the brand, is highly knowledgeable about the industry, and is extremely hands-on with the business operations (a mark of a great business owner). Michelle just came onto the business a week ago, and she’ll be leading the marketing campaigns (including social media outreach). Daniel and Adrien Desbaillets are the father-and-son team behind Salad Stop (father and son team). Both of them grew up traveling, exploring and living in over 15 countries, and eventually made Singapore their home less than a decade ago. Before SS, Daniel spent over 40 years in managerial roles in the hotel industry, with senior management positions including being the former COO for Inter-continental Hotels, COO for Millennium & Copthorne International and the CEO of Sino Group of Hotels. For Adrien, he graduated Cornell University and worked as a consultant in the hospitality industry for many years. Given their rich experience in hospitality, and their love for food and creating/building new concepts, it was then a natural step for Daniel and Adrien to start their own business in the F&B industry (Food & Beverage) – leveraging on their know-how and experience in hospitality. They saw the growing need for healthier and tasty food options among locals, and decided to spearhead and launch a salad bar in Singapore. Hence, in Nov ’09, after researching overseas salad chains, learning about their operations and doing extensive testing from recipes to store design locally, the first outlet of Salad Stop! was launched. When I knew about SS last year (2010), there were only 2 outlets. Today, they have expanded to 7 outlets, and now generate a monthly revenue of $300k USD! This is huge, especially given that they achieved it in just 1.5 years of launching their brand! This shows that there’s no limit to what you can achieve with your goals – with the right attitude, know-how and hard work, anything is possible. Today, Salad Stop is the leading salad chain in Singapore, bar none. Ask anyone about salad bars, and Salad Stop instantly comes to mind! I felt that Daniel and Adrien has a great entrepreneurial story here to share with everyone, and was ecstatic when they took on the interview request! They have been incredibly open and gracious in sharing their story and what worked/what didn’t work for them in their journey. I’ve no doubt that you’ll find their answers inspirational and very helpful. Q1) Tell us more about you, Daniel and Adrien – Who are you and what are your passions in life? Our passions in life have always been traveling and exploring the world. Both of us grew up living in over 15 countries and have made Singapore our home. We enjoy sports and of course food! We are also very passionate about creating new concepts and seeing them flourish. 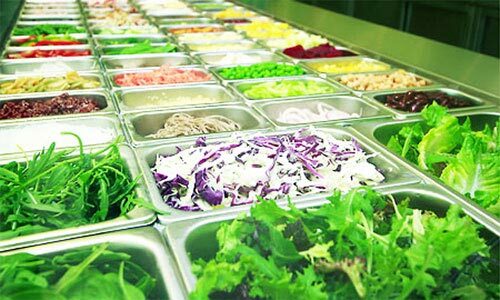 Q2) What is Salad Stop? SaladStop! is a salad bar restaurant. Having both grown up in the hospitality industry, we felt a need for healthier food options in Singapore and had a vision of bringing something innovative, fresh and tasty to increasingly discerning and health conscious customers. Q3) Who is your target audience? 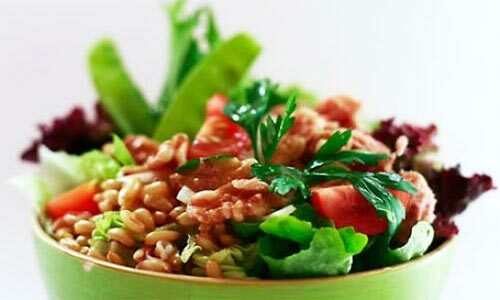 Our target market is made up of individuals seeking a convenient, affordable, healthy and fresh dining option. Q4) How much revenue is your business currently generating a month (average)? The monthly revenues of 7 outlets is over $300k USD. Celes: SS took 4 months to break even after the launch of their first outlet. That’s a really significant achievement, driven by their in-depth research, testing and astute business acumen. Q5) How did you first come up with the idea for Salad Stop? In Singapore, people are changing their eating habits and starting to seek alternatives from their usual hawker stall fare. The younger generation in particular is demanding healthier food choices and starting to view salads as a main course rather than a simple side dish or starter. We cater to these needs by offering an extensive array of ingredient / options and constantly evolving menu items. [In creating SS,] we used several international comparables to gain a better understanding of the operation but developed every aspect of the concept locally from recipe testing to store designs. We also ensured that the branding, design, store layout, product offerings and positioning would stay consistent from the first outlet moving forward. Celes: Salad bars are popular in western countries but they are still a novelty here in Asia. In getting a quick start to their business development, D&A referred to comparable brands overseas to get a quick understanding of the operation requirements for a salad chain. A lot of the times, there’s no need to reinvent the wheel. Look for people who’ve already achieved success with their goals, and learn from what they’re doing. Doing so helps you to cut down the learning curve by a huge notch. Q6) After you came up with the idea, how did you get started? Please walk us through what the first 1 year of your journey was like. We opened our first outlet in Nov ’09. The first few months were about fine tuning our processes and developing an even more detailed understanding of the market. We subsequently opened 4 more outlets in the first year. We only tweaked about 10% [of our processes] from our original outlet and each subsequent store was designed with improved efficiencies and more customized parts. We spent a large part of the initial stages testing our products, developing a close relationship with our suppliers, creating training programs and additional SOPs, improving the range of offerings and developing promotional tie-ups. Celes: Before scaling up what you’re doing, make sure you have the fundamentals and foundations in place. D&A made sure that everything was set with their first outlet, before they expanded with new outlets. Q7) How long did it take (after starting) before you experienced the first signs of success? What were those signs of success? We witnessed the first signs of success when we opened our second outlet. By Mar ’10, we were serving close to 400 customers per day there and were receiving very positive feedback in both outlets. This was due to the consistency of our product and service. We were [also] offering something different from our existing competitors. We soon gained a better understanding on the size of the market and opportunities for additional outlets in Singapore. The success of the concept provided us with the reassurance that if we maintained the consistency, we could keep tapping on that market opportunity. Celes: It’s all about providing value to customers. D&A provide very high value to their customers via (a) consistency in their product/service (b) differentiated product offering from competitors. Their large variety of toppings (over 60 options) beats the local salad bars, hands down. Another winning factor that SS had over local salad bars (for me at least) is their unlimited toppings for custom salad/wraps. Most salad bars charge for additional ingredients, which gives you the impression that they’re all about bottom-line and costs. Since SS doesn’t do that, it’s a big plus in my book. It makes me feel that they value customer satisfaction and values me as their customer. Q8) At which point did you know with certainty that it had taken off? We realized that we were onto something when we opened our third outlet. Our first 2 outlets had reached stabilized [customer traffic] levels and we were developing a loyal following. We were receiving increased media exposure and our outlets were starting to reach maximum capacity. Celes: The way to grow quickly is to ride on your successes. Once you feel that you’ve found the right formula for your business growth, build on it quickly. Time is in the essence, be it for online or offline businesses. SS acted fast, launching 7 outlets, one after another. This helped them to achieve scale quickly, which is one of their success drivers in their business (see next question). Q9) What would you say are the biggest drivers of your success today? Strong branding & Market Positioning – We have maintained strong and consistent branding among all of our outlets and have established ourselves as the most recognized salad bar chain in Singapore. Our rapid expansion has also allowed us to capitalize on the market opportunity. A dynamic team that is truly passionate. We have also developed a company culture that is based on fun, empowerment, respect for one another and we consider everyone as part of the SS family. Q10) Looking back, what were the biggest obstacles you faced in your entrepreneurship journey to date? How did you overcome them? Our first biggest challenge is manpower – finding qualified staff, especially given SS aggressive growth strategy. [To address that,] we use a number of different recruitment channels, provide attractive benefits and growth opportunities for full-timers and part-timers. We also developed a strong company culture and fun, dynamic environment that allows to retain and attract new members through referrals. Our second biggest challenge is the rising cost of goods. [We address this by] working closely with suppliers on finding alternative sources and ensuring that other costs are maintained. Celes: As an example of how SS builds a positive culture, they have regular company outings, such as outdoor BBQs by the beach, with their whole team. That’s a great way for the whole company to bond together as one. Finding quality people will always be a challenge if you are working in a team. One thing I found helpful is to always keep a lookout for great people, whether you’re planning to hire/partner or not. That way, when you do need to hire, you can immediately call upon them. Q11) What are the biggest lessons you’ve learned in this journey? The biggest lessons we’ve learned are the importance of building a strong and recognizable brand, maintaining a consistent product and building a model / standards that can be easily replicated, hiring the right people that share the same passion and belief in the success of the concept and that building a business from the ground up takes a lot of hard work, passion and 100% commitment. We also learned that [to succeed] in such a competitive environment such as Singapore, it is crucial to have a well thought out concept and to develop a thorough understanding of the financials and various market forces. Q12) If you are to start all over again, what are the top 3 things you’d do as you start your business? Develop a concept based on strong fundamentals and that can be easily replicated. Place a large emphasis on branding. Ensure that the first location offers an opportunity to test your product and that risks are mitigated. Q13) How would you advise someone who is just starting his/her business and wants to bring it to the million-dollar mark and beyond? The foundation for any start-up needs to be a passion for the concept and a clear road map on where you see yourself in the short, medium and long-term. Even before our first opening, we had developed a business plan and have stuck to our timeline. The business plan should also clearly lay out the group’s values and sticking to the core concept is key. Celes: This is great advice. You must first be passionate about what you’re doing. Next, you need to have a clear vision of where you want to be. Where do you see your business in 1, 3, 5 years? What are your key business goals? What do you want to accomplish with your business? Who do you want to serve? How are you going to address their needs? These are basic questions you should be able to answer before you start up your business. Q14) What’s next in your plans? Our next challenge was to open an outlet outside of the CBD. We are currently building our franchise model and have identified certain partners and future locations. We aim to bring SS to new levels and keep inspiring people to live a healthier lifestyle. We are also developing a new Pasta bar concept which we are very excited about and will open in July. First is to capitalize on a need when you see it. Daniel and Adrien saw the need for healthier food options among locals, and quickly jumped on that. You can either spend years and years planning for that next big thing, or quickly assess the market, identify a sizable need, and capitalize on that right away. Second is to provide superior value. Value can come in the form of the product itself, the location, and other things. SS has a very high value offering, above and beyond what competitors are offering – it’s located in a convenient location (saving people time from traveling), has superior product quality, has huge variety in their ingredient options, and serves very tasty salads to boot. Third is that there are no limits to how fast your business can grow. Usually people will think that business expansion (in F&B) is only possible in the second or third year. SS obviously proved that wrong with 7 outlets in just 1.5 years. Amazement aside, it’s a cue for me to relook into my growth targets for the blog and to set new targets. Daniel and Adrien Desbaillets is the father-and-son team behind Salad Stop, a leading chain of salad bars in Singapore. They have 7 outlets so far, and are planning to expand further in the coming years. 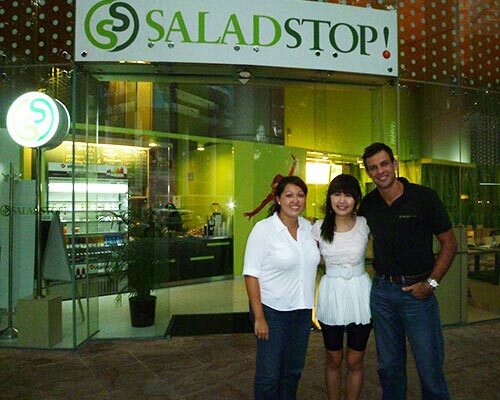 Learn more about them at their website: www.SaladStop.com.sg.